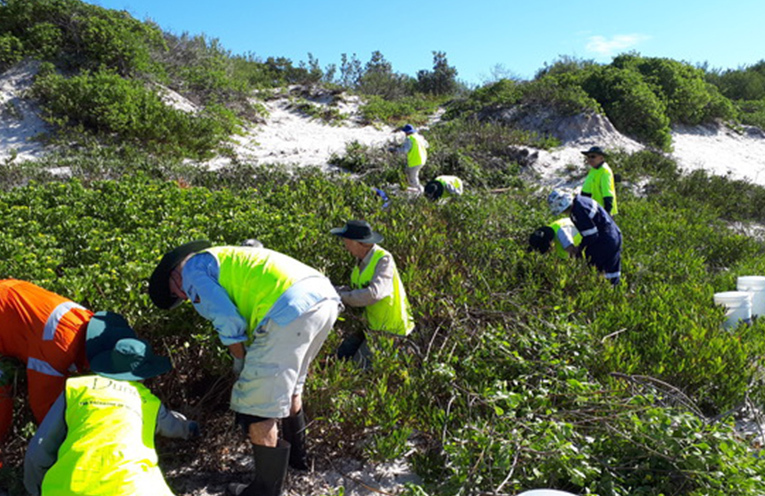 SEVENTEEN keen volunteers battled the heat to attack weeds smothering the dunes at Winda Woppa, Hawks Nest. The dunes at the western end of The Boulevarde now has plenty of healthy wattle stabilising the sand but mixed amongst it are bitou bush, threatening to undo all their good work. The volunteers cut the bitou bush just above sand level and applied poison directly onto the stems so the roots would die in the ground and continue to hold the soil and sand in place. Tea Gardens Hawks Nest Bitou Busters coordinator Jill Madden said the working session was shortened due to the heat, but it didn’t stop the volunteers from achieving great results. “Everyone agreed this area was a great place to work in,” Jill said. She thanked everyone for making such a difference to the beautiful dunes at Winda Woppa but said there was still plenty more weeding to do in the months ahead.